CHIBOK, Nigeria — The Nigerian military has announced that it has located the hundreds of schoolgirls that were kidnapped in April by Islamic militants, but is considering its rescue strategy carefully out of fears that the use of force could place the teens in danger. As previously reported, the notorious Muslim group Boko Haram had stormed an all-girls secondary school in Chibok, Borno State last month, kidnapping 276 students while they were taking their final exams. Over 50 girls later escaped, but more than 200 have remained missing for weeks. The teen stated that a number of girls escaped by jumping out of one of the vehicles carrying the students. Boko Haram, being translated, means “western education is sinful.” Shekau reiterated the group’s opposition to the West during his video statement. 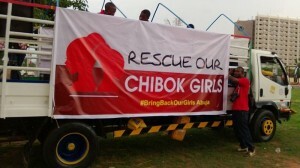 International outrage resulted in numerous campaigns calling for the release of the students, including the popular hashtag #BringBackOurGirls, and protests have been held in the Nigerian capital of Abuja on a regular basis. On Monday, Air Marshal Alex Badeh of the Nigerian military told reporters that the girls had been located, but kept their whereabouts secret. “The good news for the parents of the girls is that we know where they are, but we cannot tell you,” he said. Badeh also advised that the military is being careful about its rescue strategy as it feels that the use of force could put the girls’ lives in danger. “If we go with force what will happen?” Badeh asked. “They will die,” the demonstrators called out. Boko Haram has been in the headlines for the past five years surrounding its responsibility for numerous violent acts throughout Nigeria that have resulted in an estimated 10,000 deaths. According to reports, the group seeks to implement Sharia law in the nation, and is especially hostile toward Christians. As previously reported, 19-year-old Hajja told Reuters in December that she was held by Boko Haram and told to renounce Christianity or perish. Members of Boko Haram threatened to slit her throat if she did not give up her faith in Christ. Boko Haram made Hajja a domestic slave. She was forced to clean and prepare meals for the terrorist militia, but later escaped from her captors.